Ready to take that step and learn a new instrument? Or, are you hoping to develop your present skill level? 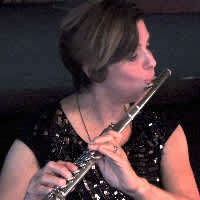 Or wanting to explore new styles and genres: classical, Celtic music, jazz and improvisation? We are professional musicians with over 30 years working in the industry in Canada and throughout the world, trained at the University of Toronto, Faculty of Music, and holding over 25 years experience teaching all levels of students from a variety of cultural backgrounds, in private lessons and in the classroom at high schools, colleges and universities in Ontario. We are thrilled to work with you, as students who are ready to step into the amazing world of live music, because we love our jobs as musicians, we love making music, we love making something extraordinarily beautiful with others and for others. And we love to share what we know and do with you because music has the power to change lives. If you live in the Kitchener/Waterloo area, we teach flute, recorder, and theory, at All Saints Anglican Church, 400 Northfield, Waterloo, on Wednesdays from 1 pm onwards.